Drs. Murawski and Mann were two of the eight featured speakers who gave 6-minute “lightning talks” at the inaugural “State of Science” event held at the new Research & Education building of Johns Hopkins All Children’s Hospital. ST. PETERSBURG, FL – Fishy serenades caught on undersea “listening stations” and new technologies to safeguard the eyesight of weary graduate students were among the topics discussed by members of the USF College of Marine Science (CMS) community at an inaugural public event organized by the St. Pete Innovation District on October 10, 2018. The event highlighted the ocean science and medical prowess of St. Pete’s Innovation District and served in part as an appetizer to the St. Petersburg Science Festival on October 20, 2018. It featured eight speakers and was held at the new Research & Education Building at Johns Hopkins All Children’s Hospital. 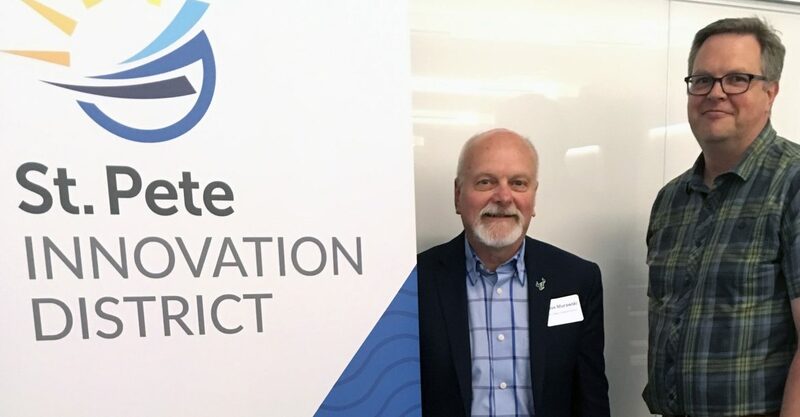 Dr. Steve Murawski, Endowed Chair Professor at the USF College of Marine Science who heads the global research program in response to the historic Gulf oil spill, highlighted technologies used to map the West Florida continental shelf, which is larger than the peninsula of Florida itself. Only five percent of the shelf has been mapped, said Murawski , who wowed the audience with new “fish-al” recognition software, an application of facial recognition software that automates the process of identifying fish from underwater video. “We can use this technology instead of wearing out the eyesight of scores of graduate students down the line,” Murawski quipped. It used to be that graduate students would have to sift through tedious reams of video, identifying fish one by one. Dr. David Mann, a former professor at the USFCMS and President of Loggerhead Instruments in Sarasota, FL, played audio recordings of the not-so-silent sea, and shared his vision of installing a network of acoustic stations around the coastline of the entire United States. Among the highlights were the snapping shrimp, which sound like frying bacon, and the soft guttural sounds of the sand seatrout, whom Mann called the “Frank Sinatra” of the fish world. 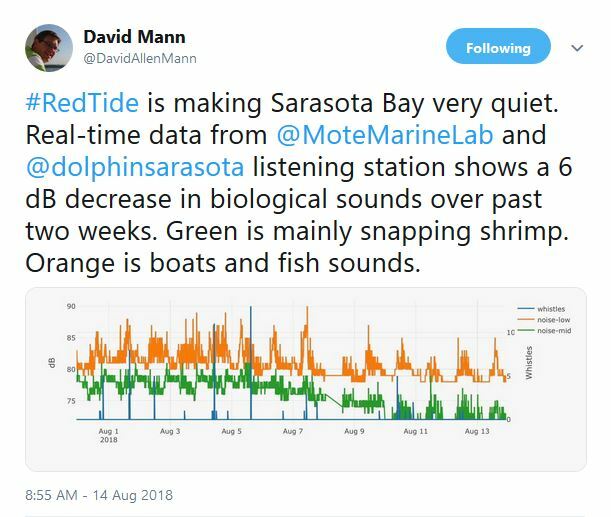 Dr. Mann said the Gulf has been eerily quiet recently due to the epic recent red tide, as indicated in a recent tweet he shared with the audience. Two additional ocean science speakers affiliated with the USFCMS community were Dr. Cheryl Hapke from the USGS Coastal & Marine Science Center and Dr. Kate Hubbard from the Florida Fish & Wildlife Conservation Commission. Hapke discussed the importance of mapping the Florida coastline in high resolution and Hubbard discussed innovative technologies paving the way forward in our ability to monitor and predict red tides. The event was sponsored by Johns Hopkins All Children’s Hospital, the University of South Florida St. Petersburg, and the City of St. Petersburg.